It's all fun and games on Pancake Day — unless you've got a food intolerance which strictly limits your options. 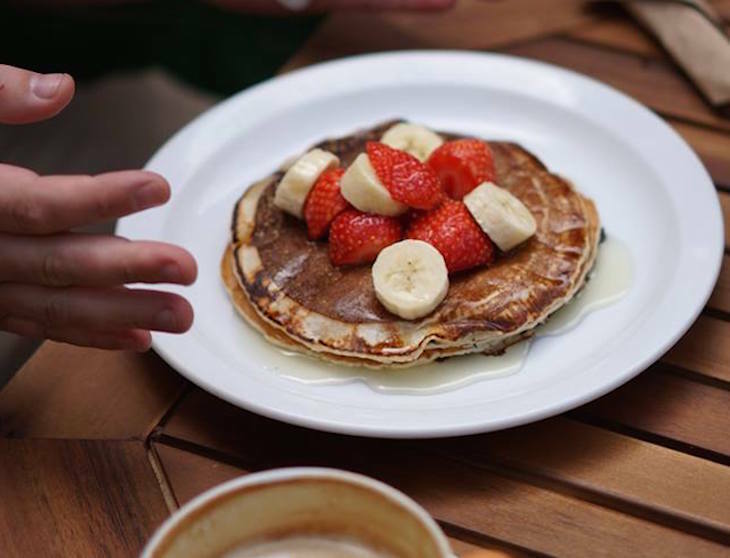 These London cafes and restaurants offer vegan pancakes and gluten-free pancakes year round. 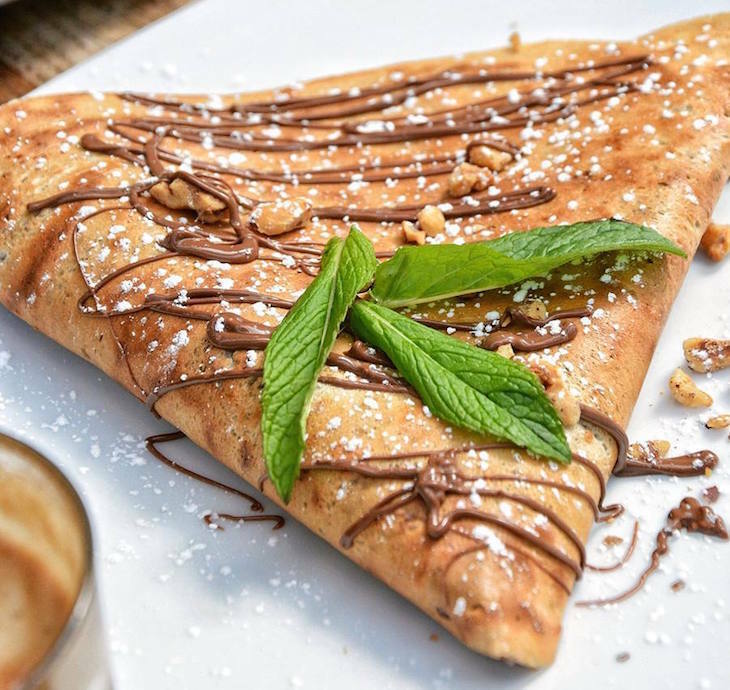 (For further Shrove Tuesday or casual pancake inspiration, take a look at our guide to the best pancakes and crepes in London). This mini-chain of very orange pancake house restaurants is often written off as a tourist trap, but it was one of the first places in London to offer gluten-free and vegan pancakes. Its gluten-free pancakes use rice, tapioca, buckwheat and potato, and any of the regular pancakes from the Classic Savoury & Sweet, Kids, Lite Option and Breakfast menus can be adapted as gluten-free. The vegan option uses the same recipe as the gluten-free option, but further swapping out milk for soy milk. If it's lactose that's holding you back from your pancake dreams, you can order a soy pancake base, which eliminates the milk. All cheese pancakes can be served with a lactose-free cheese instead for a small extra charge. My Old Dutch, Holborn, Chelsea and Kensington. Tweeting our #hummingbird #buttermilkpancakes #autumn colours poached #pineapple #lime - all stacked to lift your spirit! Any of the pancakes at this Southwark eatery are available made with the special '3-in-1 batter' instead of regular batter. The 3-in-1 batter is suitable for vegan, dairy-free and gluten-free pancake lovers, made from organic rice & buckwheat flour, soy milk and chickpea water. Obviously, you'll need to pick your toppings carefully — vegans are catered for on both the savoury and sweet menus, with baby leaves, cumin, spring onions, green chilli, lime-coriander butter as one lively option. Check the menu for details. Where The Pancakes Are, 85a Southwark Bridge Road, SE1 0NQ. This south London café serves French crepes with a Brazilian flair. Technically, pancakes aren't on the menu — it's a choice between galettes and crepes, the difference being what they're made of. The galettes contain gluten-free buckwheat flour, making them suitable for both vegan and gluten-free diners, while the crepes are made from plain flour and contain egg and dairy — so if you're vegan or gluten-free, go with galettes. Thankfully the same toppings are available on both, and the menu clearly marks out which toppings are suitable for which dietary requirements, with a whole page each of savoury and sweet options to choose from, and extra ingredients available to add. Vegan options include the Rosa Squash (tomato chutney, roasted butternut squash, courgette, red pepper confit, rocket and roasted almond) and the Sweetie Vegan (maple syrup, banana, strawberries and mixed nuts). Everything at this pink Fitzrovia restaurant is vegan, and that includes the buckwheat and banana pancakes on the all-day menu (available from 8am). They're served with coconut yoghurt, caramelised bananas and almond brittle, a combination that renders them gluten-free as well as vegan. Kalifornia Kitchen, 19 Percy Street, Fitzrovia, W1T 1BZ. 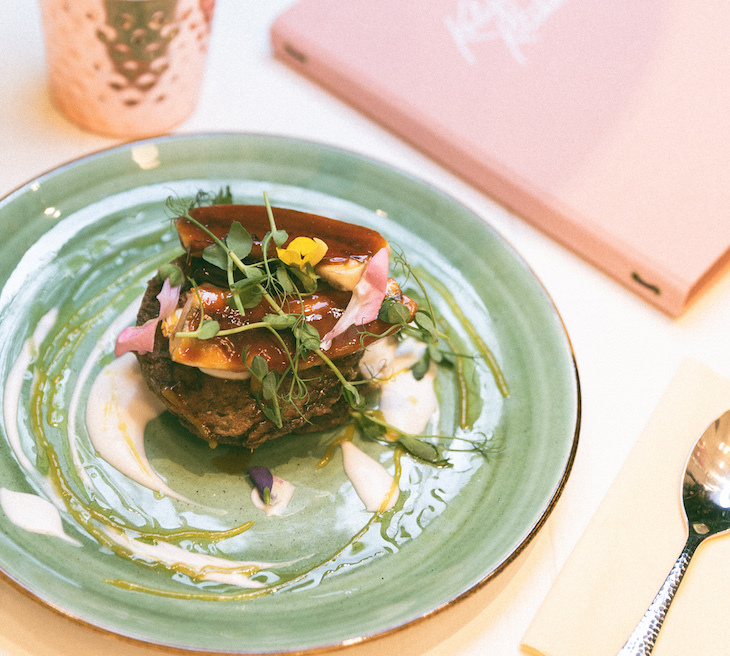 This Notting Hill restaurant offers a 'plant-based' menu (that's a fancy way of saying 'vegan', FYI), and also focuses on organic and chemical-free food. 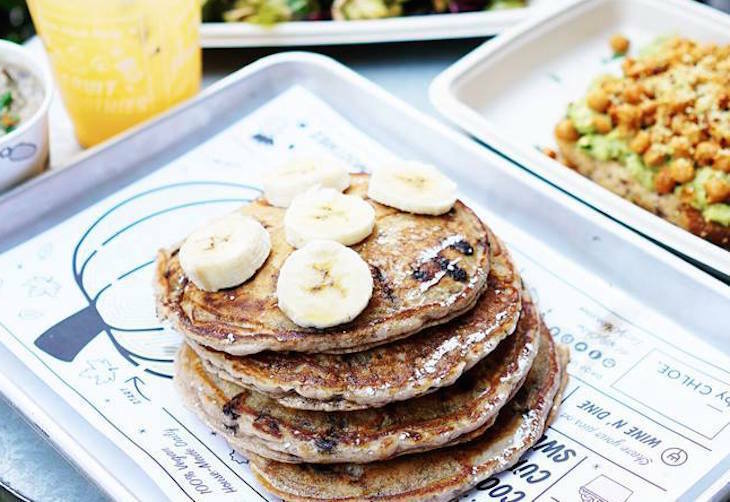 It's a very healthy menu — think cold-pressed juices and superfood smoothies — with the house pancakes featuring on both the breakfast and brunch menus. The vegan and gluten-free buckwheat flour pancakes are served with seasonal fruits, coconut 'yoghurt', caramelised pecans and maple syrup, and are available nut-free on request. Farmacy, 74 Westbourne Grove, W2 5SH. Essence extends the vegan and gluten-free offerings by serving up raw coconut banana pancakes as part of the all-day brunch menu. Raw food is food that hasn't been heated above about 40 degrees celsius, and in this case the pancakes consist of candied walnuts, berry salad, mint, and vanilla coconut cream. They're suitable for vegans and coeliacs and are served until 5pm. Essence, 94 Leonard Street, Shoreditch, EC2A 4RH. Top marks to Ethos for giving those who are both vegan and gluten-free a choice of toppings. The breakfast menu offers blueberry and coconut yoghurt, banana, walnuts and raspberry, or mango, strawberry and almond. Extra toppings including dried apricots and coconut flakes are available for a small extra charge. If you're more of a savoury persuasion, take a look at the buckwheat crepes section of the menu. The tofu and tomato salsa toasted crepe is both gluten-free and vegan, while the miso aubergine, avocado and mozzarella offering is still gluten-free, but not vegan on account of that cheese. Everything served at Gallery Cafe is vegan, and that includes the American-style pancake stack on the breakfast menu. Choose from toppings including chocolate sauce, peanut butter and banana, lemon and sugar, or apple compote and cinnamon. They're served until 12pm on weekdays and 1pm on weekends. The cafe is located within St Margaret's House, an organisation which aims to get people playing a more active role in the local community. 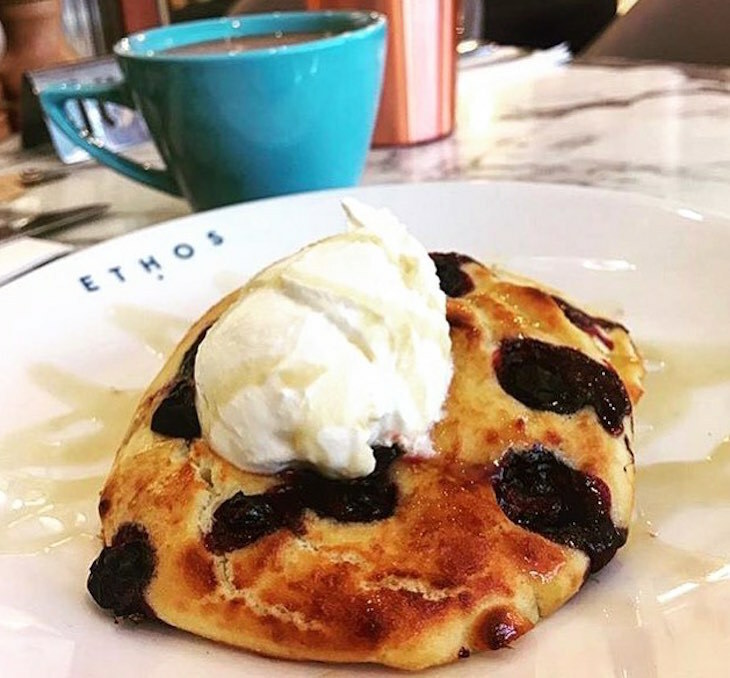 Many of the ingredients in the cafe are locally sourced, and the profits go back into St Margaret's House — so by tucking into your vegan pancakes, you're helping the local community. The Gallery Cafe, 21 Old Ford Road, Bethnal Green, E2 9PL. 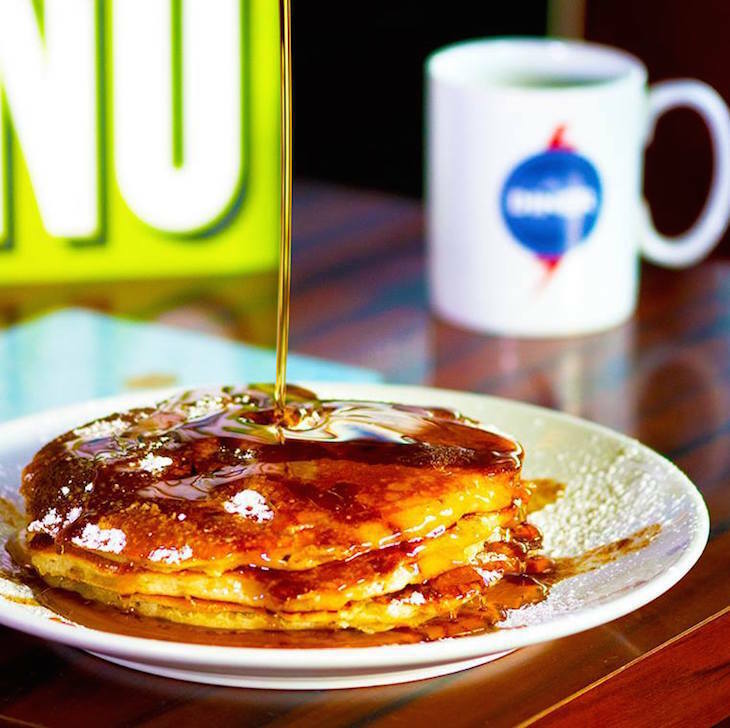 An American diner isn't the obvious place for a vegan to head, but The Diner mini-chain has been admirably upping its vegetarian and vegan offerings since 2017. The vegan menu offers four sweet-toothed, all day breakfast options. Pick from maple syrup, banana and butterscotch sauce, blueberry, or strawberry and chocolate toppings — although if you ordered one of each, no-one would blame you. The Diner, vegan menu available at Dalston, Spitalfields, Strand and Shoreditch branches only. 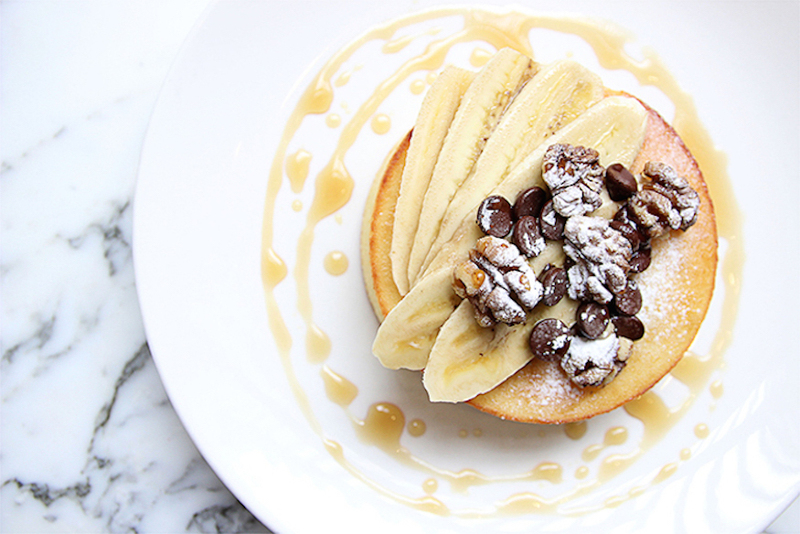 American vegan import By Chloe offers a vegan pancake on its Saturday and Sunday brunch menu (served until 4pm). It's topped with maple butter, with coconut whipped cream as an optional extra. By Chloe, branches at 34-42 Russell Street, Covent Garden, and 6 Duchess Walk, One Tower Bridge. Drop by any branch of Redemption for breakfast, and you'll find buckwheat pancakes on the menu. The vegan offerings are tossed in coconut oil and topped with natural coconut yoghurt, berry compote and caramelised pecans. Redemption Bar, 320 Old Street (Shoreditch), 6 Chepstow Road (Notting Hill) and 15 Shorts Gardens (Covent Garden). WAVE — We Are Vegan Everything — is the newest opening on this list, and is by the duo behind vegan bakery Cupcakes And Shhht. WAVE is both a cafe and food supplier, with food served everyday — including the blueberry pancakes. They're made from gluten-free flour, blueberries, banana, Oatly cream, syrup, cinnamon coconut sugar, soya milk and sugar. 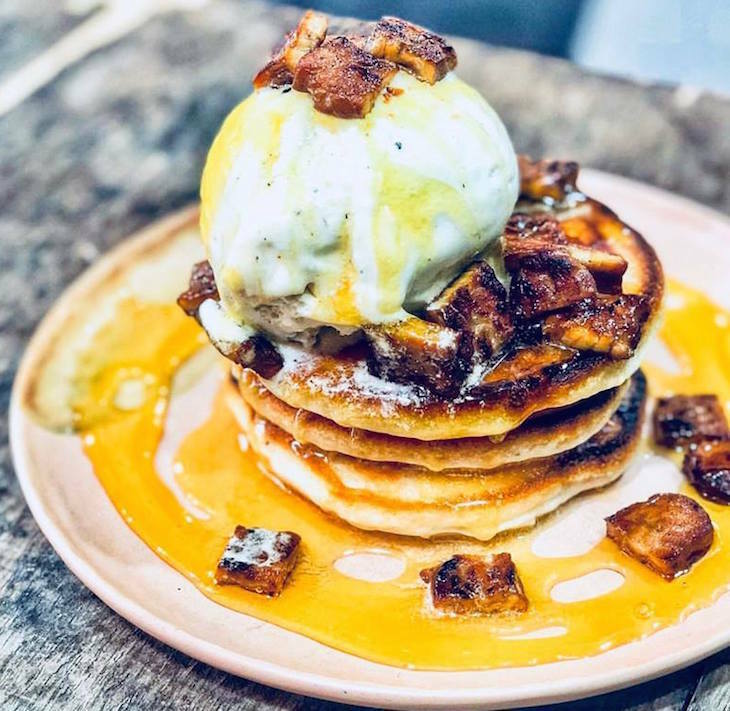 For a savoury equivalent, try the smoked maple tempeh pancakes, whipped up from gluten-free flour, crispy maple tempeh, banana, soya based ice cream, syrup and sugar. Whichever option you go for, we recommend washing it down with one of the cafe's soya based ice cream shakes or freakshakes — who said vegan had to be healthy? WAVE, 11 Dispensary Lane, Hackney, E8 1FT. 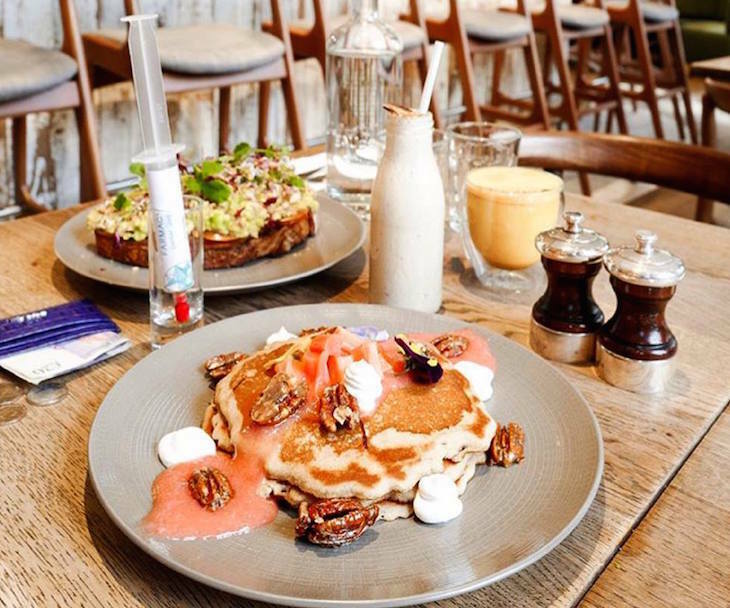 If you're hunting for vegan pancakes in the vicinity of Oxford Street, get yourself to the Weighhouse Street Deli, a product of the Deliciously Ella empire. The breakfast menu — served until 11am on weekdays and 12pm on weekends — includes vegan blueberry pancakes, which are served with fruit compote, maple syrup and granola. Weighhouse Street Deli, 18-20 Weighhouse Street, W1K 5LU.